The age-old technique of batik produces up-to-the-minute style. Jan Smiley sets off dramatic batiks with traditional patterns for delightful quilts such as Salt Water Taffy, Malaysian Marketplace, and Cosmic Carousel. 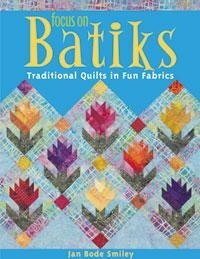 Discover what makes batiks so special, and then start planning your own batik quilt creation!